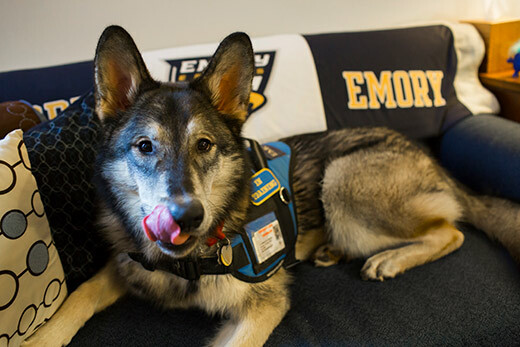 Two years ago, Emory’s Student Counseling and Psychological Services (CAPS) got its first therapy dog, Beowulf, a Native American Indian dog who assists with therapy and attends special events. Two years later, CAPS has a second dog: Beowulf’s little brother, Finn. The nine-month-old Finn is a product of a second litter, the first having produced Beowulf, making Finn a full sibling to Beowulf. Both dogs are contract workers at CAPS. “Finn has been brought on in the last few weeks. He’s all fresh and raring to go,” says Colleen Duffy, therapist and interim training director at CAPS, and owner of the canine siblings. Did CAPS hope to add to its services with a second dog? Before Duffy answers, she checks what Finn has picked up, as he dives into all of Beowulf’s toys. “We’re just incredibly vigilant with what he’s got in his mouth,” Duffy says. Beowulf tolerates Finn’s expropriation of her toys until she decides it’s time to show little brother who is the alpha dog and puts him in his place. In addition to participating in animal-assisted therapy, Beowulf has attended almost 50 events in the two years she’s been with CAPS. When Finn came along with his social temperament, he naturally fit that niche of special events. With Beowulf, it’s more trauma work, whereas Finn is out and about “being a cute little presence and representing CAPS as well,” Duffy says. Temperamentally, the two siblings are very different dogs. Beowulf, who is almost three years old, has a docile, calming temperament, while Finn is a “party boy,” she says. “He loves people. He’s very friendly, sniffy, likes to say ‘hi’ and give hugs and little kisses,” Duffy says. Wanda Collins, assistant vice president of counseling and psychological services, calls Beowulf “a wonderful addition” to the CAPS staff and expects Finn to be equally helpful. Since being on staff, Finn has already worked at several events. The first was with Beowulf, a meet-and-greet at Alabama Residence Hall. His first solo event was the Wonderful Wednesday for the Respect Program to promote the Take Back the Night march and rally. “There were over 200 people he interacted with,” Duffy says. Finn has also attended an Active Minds speak-out where stories about mental health issues and related struggles were read; the library’s pet therapy study break; and a meet-and-greet with nurse anesthetists. Interacting with students, Finn is very, very friendly. “When anyone passes by, he wants to say hi. He’s Mr. Social,” Duffy says. She also describes Finn as “a special needs boy,” noting that he has congenital cataracts. Because of his visual impairment, Finn could not be trained as a service dog. “We have to be more vigilant around stairs. He can see shadows and movement, relying a lot on his sense of scent because he’s really quite visually impaired,” Duffy explains, demonstrating by tossing a ball near Finn, who doesn’t turn his head toward the ball as it bounces close by. “We try to make as many events as we can,” she says, adding that they do need notice ahead of time to attend. Duffy says the two dogs are very well-suited for their respective jobs. Beowulf has raised the profile of CAPS on campus and Finn does it even more. For those who’ve experienced trauma or acute anxiety, Beowulf can be very soothing. “She’s really gifted at being highly attuned to people who have been interpersonally harmed or struggling with grief and loss. She’s done exceptional work,” Duffy says. She gets a lot of requests from other counseling centers who want to know how they can get a therapy dog.